What Do 9/11 Truthers Believe? Police and firefigthers work amid the rubble of the destroyed World Trade Center in November 2001. “Truthers” believe the U.S. government was behind the 9/11 attacks. Photo by Jeff Christensen /AFP/Getty Images. 9/11 truthers believe a lot of really stupid things that have either been debunked or are far beyond conceivable and always require that scores, hundreds or thousands of people, have successfully kept these things completely secret for more than a decade without a single whistle-blower coming forward. 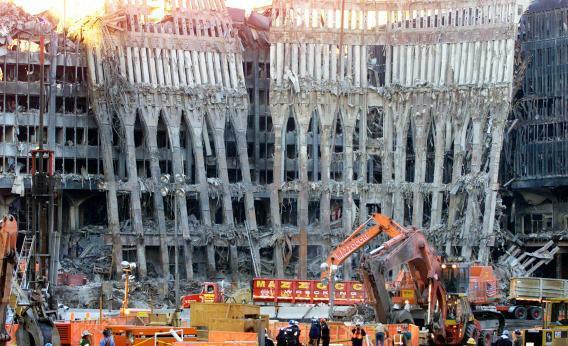 The analysis of the failure of the towers, however, explains what went wrong in great detail. I’m going to re-create most of this from memory—on purpose—to show you how easy it is to understand the collapse of those buildings. Each tower gained most of its strength from a central core from which each floor was “hung,” with additional strength provided from a series of smaller columns ringing each floor on the outside edge, not far from the windows. The impact of an airplane would destroy a number of those outer columns immediately. Airplanes and their fuel are quite heavy, so the stress on the floor upon which the remaining fuselage and fuel-laden wings came to rest would be quite severe from a weight perspective. That wouldn’t in and of itself destroy the floor, but it would put it under a great deal of stress. Once some of the fuel caught fire and had plenty of material to burn through all the paper, office furniture, walls, etc., you’d have what amounted to an “endgame” for the buildings. Why? Because the fire would burn sufficiently hot enough to weaken the structural steel in enough of the remaining support columns on several floors. Over enough time, the attachment points joining the floors to the supports would give way and a small number of floors would collapse into the base of the fire where the plane wreckage already rested. Now, you will have exceeded the weight capability of that base, also weakened by the fire. Once you have a critical mass of weight on any floor, the building is doomed. The overweight floor will fall to the next floor, making that floor similarly overweight, and so on, and so on. This “progressive collapse” will be catastrophic and nearly instant—as many witnessed on 9/11. To the extent there is video footage of the collapse occurring, it completely backs up a version of events not dissimilar to this and aligned with what appears in the official reports. Structural engineers spent countless hours attempting to understand how the collapse could have occurred and how it happened so quickly. The design of the WTC was reviewed to understand that the fire insulation was of a spray-on type that while sufficient for almost all normal events would likely have been almost instantly compromised by a plane crashing through the building. An actual understanding of the temperatures needed to weaken the steel would lead one to understand how the support columns could fail without one needing to prove there was some impossibly hot fire. The most ludicrous part of the 9/11 truther conspiracy theory is the inconsistency of it. It consists of numerous subspecies of nutjobbery involving foreign governments seizing the airplanes, missile strikes, etc. But since the WTC buildings unequivocally fell, the truthers have decided that they were brought down by “controlled demolition,” presumably done by nefarious forces within our government. To be clear, this would have required the kind of explosives normally used to bring down buildings slated for demolition, but on a scale rarely (if ever) employed by mankind. So for this theory to be true, the government must have brought in explosives by the truckload for days or weeks into the WTC, positioned them on nearly every floor, and done this without anyone noticing it or reporting it. While this would be extraordinary in almost any building, it would have been especially so in WTC, which had been bombed by terrorists before, in 1993. You are talking literally tons of explosives being prepositioned in the building, placed all over, and ignored. Since explosives are typically wired together in part to allow for the series detonation (if you’ve ever seen an “implosion,” you know what this looks like), they also would have needed to be linked together across the 110-floor layouts of the buildings. Now, having done this, the government then also arranged for two commercial airlines to fly into the buildings within about an hour of each other, two other commercial airlines to be hijacked, and then detonated these explosives to bring down the buildings. Presumably, these hijacking and crashed planes were there to cover up the detonations. But the plan—even as conceived—was so poorly arranged that the “real target” World Trade Center 7—had no airplane and was merely bombed by the government later in the day because of some secret government evidence that needed to be destroyed in its basement. You got all that? Not just bombs. Bombs and planes. Or just bombs. And some extra planes going elsewhere. All a bunch of diversions. Oh, and the purpose of all this vs. what the rest of us actually believe from the “it was just Al-Qaida and airplanes” version? There is no material difference. In other words, even if the government was behind this, it was sufficient to hire 19 young Arab patsies and use the planes. So why this nonsense with the explosives? Even though there were hundreds (perhaps thousands) of people who witnessed an American Airlines passenger jet crashing into the Pentagon, truthers believe a missile hit the Pentagon. This was among the least important parts of the Pentagon. And there is evidence that the plane may well have been targeting the White House but diverted to the Pentagon when it quite possibly could not locate the White House from above. There is further evidence that the last plane may have been targeting the Capitol before crashing over Pennsylvania, yet no missile was fired at the Capitol. If you believe no plane actually crashed into the Pentagon and the plane that allegedly did somehow disappeared elsewhere (again, the idea that it never took off is so far beyond the realm of the possible, that even conspiracy theorists can’t go there), you have to wonder why the missile that was targeting the building of Flight 93 wasn’t fired anyway (and the Flight 93 debris field just covered up by the government). The simplest solution, according to truthers, is for the weak minded and only the most complex, convoluted solution must be correct, no matter how bizarre and impossible it must be. According to truthers, this missile-firing, building-bombing, plane-disappearing plan that was 9/11 happened. Surely, it must have involved thousands of people, right? They don’t bother with this detail, but we can presume so. Some kind of navy vessel or aircraft was used to fire the missile. Some kind of explosives team was required to move thousands of pounds of explosives into the buildings. Some kind of special ops was needed to make the “Pentagon plane” disappear without a trace. And not one of these people has blown the whistle. Not one has written an anonymous note to a news organization or WikiLeaks or committed suicide explaining their role in this plot. In short, 9/11 truthers believe things that there is absolutely no reason to believe contain any truth whatsoever and certainly no important truth. They take details from the official reports that they don’t understand and try to inflate them into “evidence” of a coverup. Was the United States government behind 9/11? How does a commercial 757 crash into the Pentagon and only leave a hole this size? Why do 9/11 conspiracy theorists disbelieve the official story?